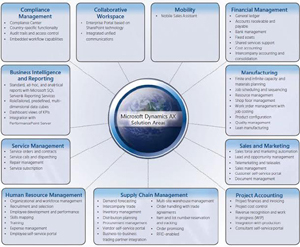 Microsoft Dynamics is a line of integrated, adaptable business management solutions that enable organizations to make important business decisions with greater confidence. Microsoft Dynamics works like and with familiar Microsoft software -- easing adoption and reducing the risks inherent to implementing a new solution. Microsoft Dynamics AX (Axapta) has been consistently rated among the top 3 ERP solutions worldwide. STS's Microsoft Dynamics Center of Excellence (CoE) is geared to help organizations and their divisions meet their business objectives of ERP / CRM implementation. Focuses on Dynamics AX, Dynamics NAV, SharePoint and Dynamics CRM. Is a part of various early adoption programs. The knowledge acquired through various early adoption programs is directly translated to the customer in terms of implementation, creating deployment roadmap, evaluating new functionalities, etc. Helps organizations harness the rich features and functionalities of Microsoft Dynamics AX, NAV, SharePoint and CRM by bringing in industry-specific adoption accelerators, effective migration and upgrade methodologies, best practices, toolkits and value-added supplements. STS leverages on its rich experience in implementations to provide a gamut of services on Microsoft Dynamics AX, SharePoint and CRM to customers and partners, helping them benefit from their rich features and functionalities to derive more business value. STS provides low-risk end-to-end services, built on mature methodologies, through a framework-driven approach and a proven cost-effective global delivery model. STS's service offerings extend across the full nine yards -- from Gap Analysis and Requirement Mapping to Deployment, Training and Post-Implementation Support. Based on our deep expertise in the earlier versions of AX (2.5 & 3.0) as well as early exposure to Microsoft Dynamics AX 4.0 and AX 2009, STS is in a unique space to help organizations upgrade from the earlier versions of AX to Microsoft Dynamics AX 4.0 and AX 2009. STS's methodology and tool assisted upgrade service offering for AX ensures efficient and effective upgrades. Technical Upgrade: Upgrading the existing functionality to a new platform. Functional Upgrade: Enhancing the implementation by upgrading the new functionality to a new version. Re-implementation : Involves business process changes as well. STS offers extensive support to customers with its global delivery support, functional and core technical support, L1, L2 and L3 support through its established processes, and tool-based approach for reporting and tracking. Application Usage Support (L1) : STS offers services like Administration, Functional Support, End-User Training, etc. Application Maintenance Support (L2) : STS offers services like Report and Form Maintenance, Interface Maintenance, Workflow Maintenance, etc. Advanced Support in Coordination with the Principal (L3) : STS offers services like Bug Fixing and advanced support in coordination with Microsoft. STS helps large and medium enterprises optimize their investments in enterprise systems by developing Business Intelligence, Analytics and Reporting, and Business Performance Management solutions for them. STS also helps software product companies integrate their software products with Microsoft Dynamics AX, NAV, SharePoint and CRM, using the best-fit EAI scenarios like BizTalk and Web services. STS also offers services for migrating from legacy and competitive platforms to Microsoft technologies.